Are you naturally a courteous and helpful individual? Is opening and holding a door for another individual an ingrained courtesy? Continue reading for information on your future as a doorman! After a long and busy day, a businessman returns to his lodgings. A doorman rushes out to hold an umbrella and open the door for him. The niceties at this hotel is what makes it competitive with other, more grand hotels and the exceptional service makes it an excellent choice for business and personal travel. A doorman greets residents, providing them shelter from bad weather and holds doors open, providing top quality care. As a doorman, you’ll spent significant time on your feet, often outside during a variety of weather conditions. Doormen often find building particular qualities to be especially beneficial in their career, including social skills, communications, attention to detail, integrity, concern for others and a service-oriented attitude. 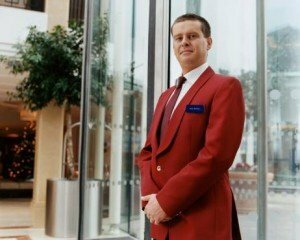 Though most doormen aren’t expected to have much education, any opportunities for advancement will often require an associate’s or bachelor’s degree in hospitality or restaurant and hotel management. Continuing education courses are another wonderful way to expand your knowledge and advancement potential in an organization. Either after or while finishing your degree program, you will be able to apply for positions as a doorman. Signing on as a doorman at a high-class operation is an excellent way to get a foot in the door, and then be able to advance in your career after you finish your educational program. There are several hospitality associations, in individual states, the U.S. and internationally, which offer exceptional classes, career opportunities and certification options to members. Great with food in a mad rush? Counter attendants at cafeterias, food concessions and coffee shops take orders, assemble them and handle payment. Better at serving a few groups at a time? Waiters and waitresses take care of small groups of people to ensure that their dining experience is a pleasant one. Is room service for you? Nonrestaurant food servers deliver and lay out food for other situations, including hotel room service, hospitals and nursing homes. Want to make sure everyone’s getting the best possible service? Restaurant, lounge and coffee shop host and hostesses oversee a number of waiters and waitresses to ensure that a restaurant’s customers are taken care of. Good with clothing? Locker room, coat room and dressing room attendants see to linens, client outerwear and clothing available for sale as well as providing customer service to their customers. Are you quick with calculations? Cashiers calculate a customer’s order, package it and receive payment for items purchased. Want to provide great service to shoppers? Sales floor stock clerks not only ensure that sales stock is neatly displayed and adequately stocked, they also help customers find exactly the right product and assist them with their purchase. The average annual salary for a doorman was $18,730, lower than the average of all careers at $33,840 as of May 2010. This can be a great career to get into while going through school to provide you experience in this sector before seeking a more advanced position after you finish your educational program. Opportunities for doormen are expected to remain close to the same average of all career tracks at 10% to 19% over the next decade. Opportunities for advancement are expected to be about the same as for doormen.